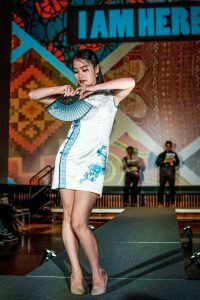 Heels clicked down the runway and gowns shimmered in the spotlight as student models showcased garments from various countries and cultures at the Cross Cultural Centers’ (CCC) fashion show Jan 30. 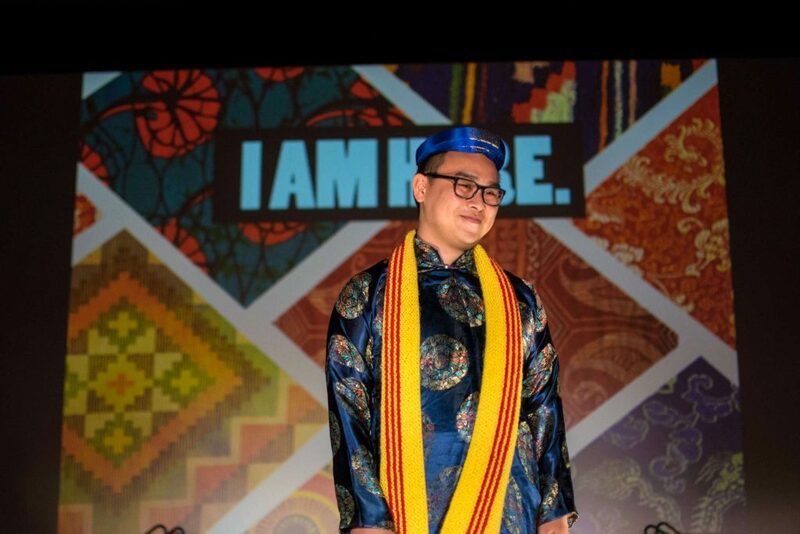 Unlike last year, this year’s fashion show encompassed more than multicultural fashion. Queer fashion and women’s fashion were also incorporated to celebrate intersectionality. Student models walked down the runway as hosts explained the cultural significance of their outfits to the audience . 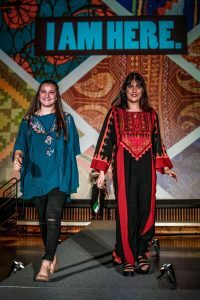 Art and design sophomore Danielle Sher walked the runway representing Israeli culture. With the 12 tribes of Israel stitched in Hebrew on her jeans, a bright yellow top, a military-style hat and a traditional Jewish Chai necklace (a symbol of life), Sher brought a modern Israeli look to the show. “I was going back and forth between trying to find something that was traditionally Jewish, but that wasn’t really reflecting who I was or the actual modern Jewish population in Israel or the modern values,” Sher said. While orthodox traditional styles are still abundant and present in Israel, Sher said she wanted to reflect her own personal style. The show’s theme “I Am Here” allowed underrepresented groups on campus to assert their presence and foster a sense of belonging on a campus that significantly lacks diversity. Kinesiology sophomore Garrett Brisbane said the lack of diversity on campus hinders students’ knowledge of cultures unlike their own. “I see a lot of different people just staying in their bubbles and being comfortable with people who look just like them and speak just like them and think just like them. But that’s repetitive and you don’t grow that way,” Brisbane said. 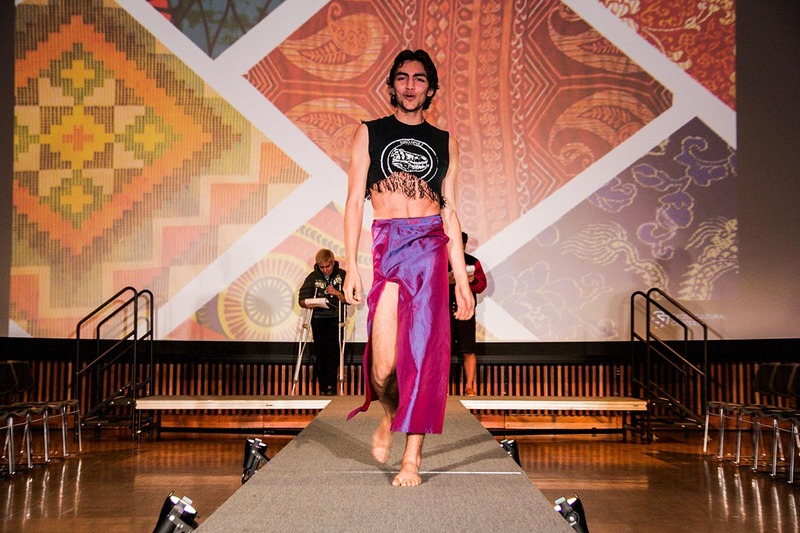 Brisbane sported a long, slitted purple skirt and a fringed crop top; he was one of the models representing queer fashion. Brisbane hoped the show encouraged students to learn more about people who may not share their cultural background. “Hopefully people will become more tolerant of people who aren’t just like them. Hopefully it’ll make them curious and hungry to explore other peoples cultures, ask people questions and hang out with people of a different culture,” Brisbane said. Industrial engineering sophomore Nora Kabbani has participated in cultural fashion shows since she was a child, but this was her first show at Cal Poly. For this show, Kabbani wore a Palestinian dress made by her grandmother who lives in Jordan. Kabbani said the dresses help her feel rooted in Palestinian culture despite a tense political climate. And the dress did. The colorful patterns on Kabbani’s dress were inspired by objects in nature — trees, the moon and stars.